The ins and outs of hiring the Funky Diva Artists Collective to take care of your hair and makeup for your special occasion. Every Bride has a different budget, our wedding prices are designed to work with every ones budget. Our wedding prices range depending on the level of experience of each stylist. Check out our “how to make it work” section which explains how to receive discounts on our wedding prices and make your budget work for you! Remember to read the “How To Make It Work” section below after you look at the wedding prices. In this section, we list how we can work with your budget so that you can have it all! You will always get a better deal when booking a package versus booking individual services. In 90% of all our weddings, when a bridesmaid or mother-of-the-bride books only hair or makeup, she ends up changing her mind on the day of the wedding. Why? Because she realizes that everyone else looks amazing and wants to look just as good! Why is there a price range? Firstly, it’s quite simple really. If you want the best, then you have to pay more. 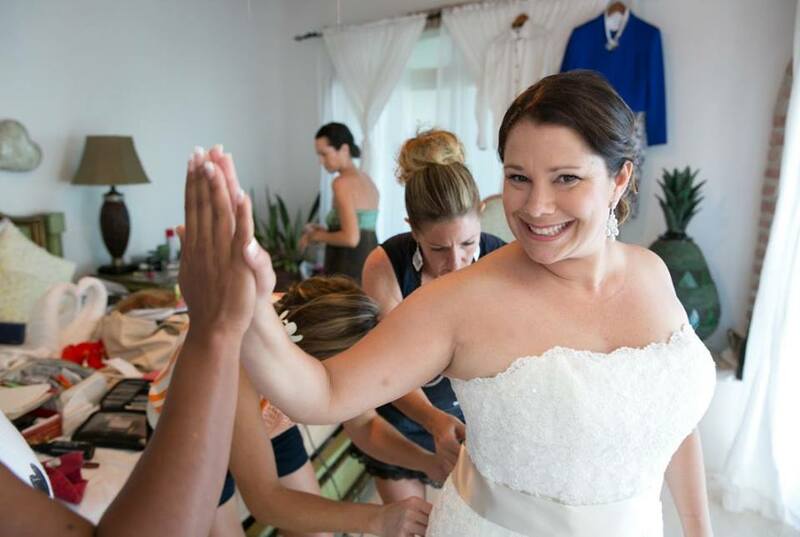 If you want a stylist who has done over 1,500 brides, then you will pay $345 for that level of experience and expertise. If you choose a stylist with under 100 brides, then you will pay $195. The more experience, the higher the price. Secondly, location plays a part – depending on where you get married, prices will vary. Bridal Package – $195 to $345. Includes ensuite hair and makeup services and a full one-hour consultation. Plus, dressing assistance, final touch-up, and hair on one flower girl under the age of five. This package can also include a changeover in between ceremony and reception for an additional fee. Bridesmaid’s Package – $145 to $225. Includes ensuite hair and makeup services, plus a personalized consultation on the day of the wedding. Mother’s Package – $125 to $165. 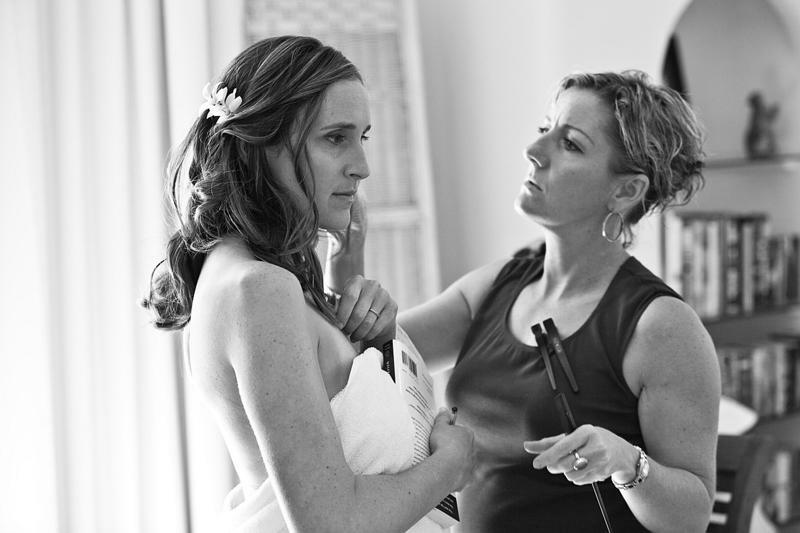 Includes ensuite hair and makeup services, plus a personalized consultation on the day of the wedding. Marjie designed the consultation process after 12 years and over 1,000 brides. It was officially born after the season she almost quit doing weddings. She had had many great brides, but also a few that she just couldn’t make happy. Why? It wasn’t anything Marjie physically did wrong, it was simply that the vision the bride had of herself and the vision Marjie had were not the same. The vision between bride and stylist needs to be unified for it to be physically attainable, and if it isn’t, then we will let you know. (A fair skinned, blonde can’t look like J Lo on her wedding day, no matter how much she pays her stylist). The time spent together in consultation will determine if Funky Diva Collective is the right fit for you. We will also determine what you are going to look like and how you want the day of your wedding to flow. It is a lot more than just picking your hairstyle and lipstick colour! All of our stylists have been trained in our very specific consultation process. The purpose of the one hour consultation is to create a plan for your perfect wedding day. At the consultation we will discuss the specifics of the day, your personality, specific likes and dislikes, gown and accessories, and what your ideal look is. Upon leaving, you will be given a list and time line of all the necessary things you will need to do prior to the wedding, plus the items you will need to bring with you on your wedding day. The consultation is designed to alleviate the stress of the preparation process. The consultation can be done in person or over skype depending what is most suitable for the bride to be. We recommend that the consultation be done a minimum of 3-4 months prior to the wedding day. The Trial Run . . . Is It Necessary? Only you will know if you need a trial run. If a bride is unsure of a hair style (example “do I wear it up or wear it down?”) then yes, we would recommend a trial run. Because the consultation is so detailed, 95% of our brides do not feel the need for a trial run. However, if a bride chooses a trial, we try to incorporate it with another event, such as an engagement photo shoot, boudoir, or rehearsal dinner. This way we can trial the wedding day look and then we can change it into another special look for the event. (Please note that trials are an additional fee). You want it all and deserve it all, so let’s make it work! We get it, everyone is on a budget. It is totally normal to blow your budget on the dress and shoes and forget about hair and makeup. Or to think that you can just do it yourself. The question is, how much is your head worth? We bet it’s worth a lot more than your shoes that will be hidden under your dress. Plus, how much are you spending on photos? Do you want them to be amazing, or just okay? A photographer can do a lot with Photoshop, but not everything. Book 5 or more packages and save 10%. Include your hair/makeup trial or hair/makeup for your engagement photos, boudoir, and rehearsal or trash the dress. Each one counts as a package. And that to a few bridesmaids and a mother, and you could be saving over $100. Pay early! Yup . . . pay your balance in full 60 days prior and you save 5% on the remaining balance. Every little bit helps. Let us know your budget, maybe you and your mother need a stylist with a lot of experience, but your bridesmaids are pretty easy and would be happy with a bronze stylist. Based on your needs, we can put together a package that will work within your budget. All quotes in US dollars for Mexican weddings / Canadian dollars for Canadian weddings. Surcharges apply for early morning services prior to 9 AM. 60 day cancellation policy, full refund of deposit prior to 60 days. Cancellations within 60 days are subject to full charge. Ensuite service is restricted to Whistler / Sayulita area, additional charges for other destinations. 15% gratuity will be added to all bookings. Late fees will apply: they are calculated at $25 for every 15 minutes that the bride and/or group is late. Paypal is subject to a 5% surcharge.